kids science experiment – make Slime, BUT is it safe? Children’s science party companies love to make slime (in their case ‘Putty’) and we’ll teach you how to make ‘REAL’ Slime at home at a fraction of the cost! kids science experiment -make Slime, Oobleck, flubber or slime can be made in many forms and different colours. It oozes through your fingers but doesn’t stick to your skin. Squeeze it and it acts like a solid, let it relax and it will ooze like a liquid. 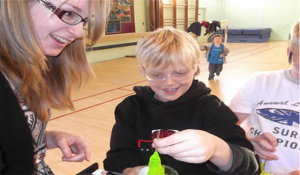 Slime is great fun and is used in many mad children’s science parties. Thanks to Gizmo’s Lab you don’t have to spend lots of money contacting a children’s science party company for a slime party. We will show you how to make it at home for practically pennies! PLEASE ENSURE YOU HAVE ADULT SUPERVISION AT ALL TIMES. Step 1. Measure 1/2 cup of the PVA glue and 2 drops of food colouring into a bowl. Exact measurements are not that important. Just try and get it close. Step 2. Add a tablespoon of liquid laundry detergent. You can use any type of liquid detergent. Again, just estimate the amount. Step 3. Using the same tablespoon, stir well. You will notice that the liquid starts to ‘clump’ together making a nice gooey mixture – slime! Step 4. Clean up your area and equipment. Step 5. Enjoy your slime! This slime will last for several days and when you finish playing with your it, you can place it into a grip-seal bag and store it in the fridge for future use! Important! DO NOT eat or put on clothing or your carpet! In case of accidental contact with either, just use a damp cloth, a little soapy water and gently rub it. This can be hard to remove if it dries so you need to act fast. Did your slime work? Was is easy to find the ingredients? Was is easy to follow the steps? How long did you keep the slime for? If you keep the slime exposed to air, what happens after one day?